A small team of us have been working and working to get everything shiny and perfect. 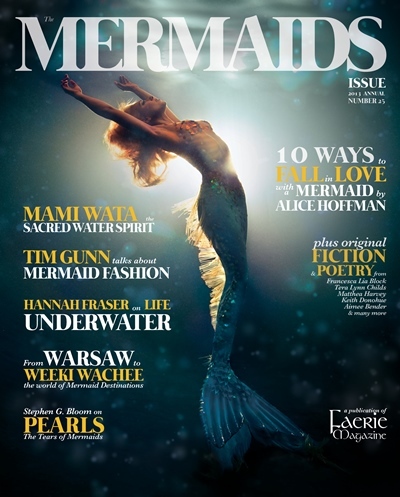 And there’s all kinds of amazing content: beautiful original fiction and poetry from writers like Alice Hoffman, Aimee Bender, Keith Donohue, Francesca Lia Block, Matthea Harvey, Tera Lynn Childs, Sarah Porter… Articles on everything from Mami Wata to Superman’s mermaid girlfriend to cover model Hannah Fraser and tail maker Eric Ducharme and ocean conservation… Not to mention a bunch of featured mermaids and glamorous destinations and photography so vivid you’ll start to hear the crash of ocean waves and the flip of shimmering tails moving through water. Here is a little sneak peek. And you can order the magazine right now from the Faerie Magazine website.